We have warmth and dry sunny days here at the moment so I’ve been making the most of it in the garden, getting it neat and tidy for Caoimhe’s Communion this Saturday. All last week I had meetings to go to in the evenings for it and this week sees a lot of the preparation work being done early. I was asked what was on the menu this Saturday, well its a cold buffet which I like but I’m getting help on some of the dishes as my mum and aunt offered to help, this frees up some time for me to spend on the desserts. Now on the dessert menu there is Strawberry Cheesecake, Banoffee Pie, Dutch Apple Cake and I’m going to make a Mint Cheesecake on a Chocolate Biscuit Base, this I’ve not tried before so will be a resounding sucess or a complete disaster, lets all hope for the former lol. I promise pictures will be taken of Caoimhe in all her style and of the ceremony and the yummy desserts lol. Next week I hope to bore you all to tears with photos. IHSW weekend was this past weekend and I got no stitching done. Saturday I had planned to start the fishing but ended up in the dr’s out of serivce with Alan and his finger which was swollen and bruised from basketball the previous day. Him being a child they wanted an xray to make sure none of the small bones were broken, which thankfully they weren’t but a trip to A & E here means several hours and we were just back in time when his friend came over for a play date so there went my Saturday and I was just to tired to stitch that night and on Sunday I knit some more of Ruairi’s sock as I couldn’t summon the energy for stitching. I’m hoping after this weekend I can get back to it. I did finish the rotation on Hogwarts and have a picture of that for you. (very boring up to this isn’t it picture wise lol). I have finished the black on this first page and am now filling in the rest of the colours. Thats all I have for you this week I’m afraid. Goodness, you've been busy, with all the planning. Hope all goes well. The Hogwarts crest is looking great, love the colours very striking. The crest looks great. Any progress is a good thing. Desserts sounds totally scrummy yummy Ruth! Can't wait for the pics 🙂 Poor Alan! Hubby had our eldest at the emergency on Friday too – she'd also managed to get fat swollen and bruised fingers while playing netball! Luckily nothing hurt just badly sprained – and yes it was about 3 hours before they were home with the finger's all splinted to keep them immobile for the week! Hope Alan's weren't hurt too badly! O MY G!!! Those desserts just sound heavenly 🙂 (frantically looking for plane times now to just drop in ;-p) Hope Alan's finger is on the mend now.Hogwarts is looking fab – the shading gives it a real 3D effect. 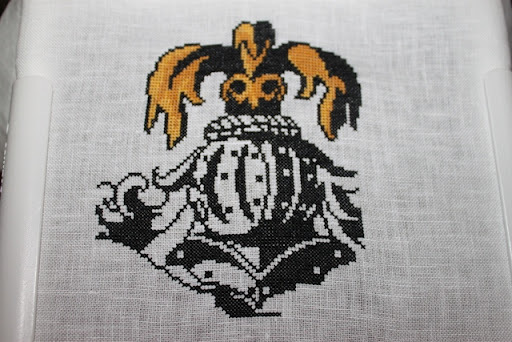 You made some great progress on the hogwarts crest, it looks fantastic! 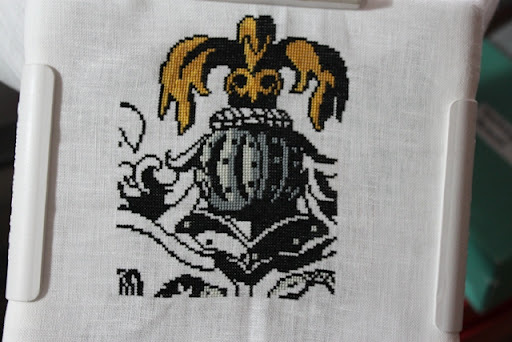 Sorry you didn't get any stitching done last weekend, but the crest is looking good.All of those desserts sound delicious! Your crest looks great!Those puddings sound yummy! I love mint choc things, and quite often make grasshopper pie which has a mint and choc liqueur flavouring in it…yum!I reckon you will have a super day on Saturday, I think the weather is supposed to be good and what with all your graft in the garden you will be a domestic goddess!Have a great weekend! You never fail to amaze me with all you get done. Seeing your stitching pictures makes me miss my x-stitching days all the more. My tired, 50 year old eyes just can't handle it after spending all day at work on the computer. I thing Gorgeus girl is so lovely and such a treasure for your little girl. Your after communion brunch sound so lovely and will be a memory making event for sure for your family. *smiles*PS: I still hope to get back to dishcloths–have you abandoned the challenge for awhile too?